We are located in Davis Square at 408 Highland Avenue, Somerville, MA, less than a 1 minute walk from the Davis Square T stop on the Red line. All of our programs are taught by qualified black belt instructors and are geared towards your individual goals. Our classes are positive, engaging and will challenge you both mentally and physically. If you would like to register for a FREE martial arts class, or if you have any questions regarding our programs, please contact us by phone at (617) 591-9656, or email admin@davissquaremartialarts.com. Davis Square Martial Arts is located on the Red Line T, with about a 1 minute walk to the school making it convenient to all of Boston. Tufts University, Cambridge, Medford, Somerville, Belmont and Arlington are all within a 10 minute drive. 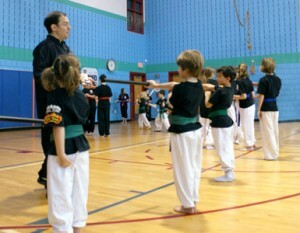 The emphasis of the Kung Fu program is to create a positive learning environment for students to challenge themselves both mentally and physically. The goal of Kung Fu training is for each individual to reach their full potential. The forms and training (e.g., Shaolin Longfist, Southern Fist, Tiger and Staff) are designed to improve the body’s strength, flexibility, endurance, coordination and control. More importantly, these movements will challenge the student to improve patience, focus, and will power. Through diligent and consistent training, students continue to achieve goals that they once thought were out of reach. 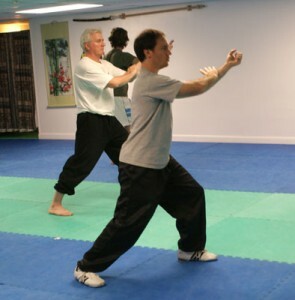 Tai Chi differs from Kung Fu training in both form and intensity. In general, the postures are higher and the movements are slower, allowing the practitioner to focus more on breathing, fluidity, exact body alignment and relaxation. Through the practice of the 24-step Yang style form and a variety of Qigong breathing sets, this class will focus on learning correct breathing, relaxation, balance, strength and flexibility. The goal of this program is to improve the body’s overall health and energy level (by strengthening the respiratory system, the immune system and improving circulation) and is appropriate for students of all ages.